Miriam repeated words like this many times today. I don’t know why I get sad when getting rid of a car. Am I doing the right thing?? How can we just leave it here to be scrapped after it did so much for us? Fortunately, I get over it pretty quickly. Miriam on the other hand is maybe scarred for life. This old car means more to Michael than it does to me. It was a gift from his grandparents back in 1989. Six months later, he moved to London for grad school and had to sell it. The friend who bought it never kept up with her payments to Michael so, when they reconnected about 10 years ago, she just gave him back the car. We were glad to have it. My car was a stick shift (which Michael can’t drive) and his van was giving out. Two years ago, the car failed its smog test. We spent $700 getting it fixed. 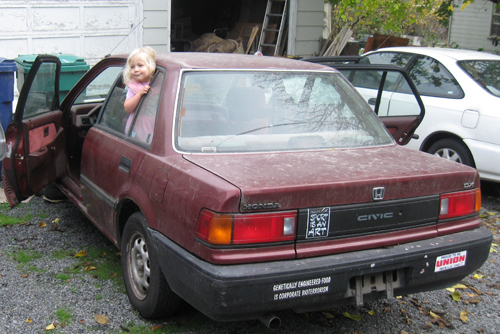 It passed the smog test and, a few weeks later, one of the 4 cylinders died. It wasn’t worth fixing at this point and we bought a used car as a replacement. We found out about a program California has to take older cars off the road. If you fail a smog test, you can turn in the car and get $1000, which is about what this car was worth running decently. Unfortunately, you only qualify at the time of registration. We spent two years kicking ourselves for not doing this then. All the while we kept the car registered and insured and Michael drove it every month or so to keep the battery charged (he still had to jump it a few times). Although you register a car yearly, you only do the smog test every two years, so we had to wait. Our chance came a couple of weeks ago. Michael took the car in and it failed massively, as we expected, and was labeled a gross polluter. That’s about when we learned that the state doesn’t buy cars just for failing smog, they have to be gross polluters, and this car was not one two years ago. Last night we stripped the car of anything loose and Michael removed the radio this morning. Then he went to the DMV, turned in the plates, and filled out forms. Miriam loves to ride in the car so Michael transferred her car seat and gave her one last slow ride up to Windsor, about 30 minutes away, while I followed behind them. After endless paperwork, we got our check. As we drove away, Miriam called out her final goodbye and insisted we each do the same. Goodbye old car and thanks.